This article will offer an in-depth overview of the Marcy Diamond Elite Smith Machine, including features and recommendations. This fitness product presents itself as an all-in-one home gym power rack that has all the tools you need to start working out from home. The rack has several accessories to ensure you can fulfill all your exercise needs, while keeping all the tools in one area. Although individuals who are new to exercise may need to follow a learning curve with this machine, it is accessible to anyone who wants to improve their fitness and strength. The cage is 95 x 79 x 86 inches when assembled. It weighs 430 pounds and has a 600 pound total weight capacity. The rack is constructed of heavy duty tubular steel , as well as the additional implements it comes with. The rack comes with a weight bench, butterfly press arms, a 4-post angled squat rack, multi-function pulleys, a 6 part dual action foam leg developer, an Olympic free weight rack, and several extra attachments. Anyone who has used commercial gym equipment will have an easy time navigating their way around this model. If you have never exercised in a typical gym before, you may have to learn your way around the various accessories. The cage can accommodate a variety of common gym exercises, so advanced and beginner exercisers would be able to use it in several practical ways. 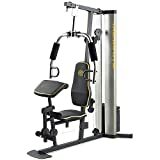 The Marcy Diamond Elite Smith Machine is ideal for working all areas of your body in a well-rounded fitness regimen. We recommend you utilize the smith machine rack for compound movements such as back squat and bench press to begin your workout. The Marcy Diamond Elite Smith Machine does not require excessive maintenance. Assembly can take some time, but after a few hours are dedicated to that task, it does not need to be revisited again. If you want to keep the machine in tip-top condition, it will benefit from the occasional wipe down with basic cleaning wipes. This machine has several attachments and pieces, and those pieces will stay in the best condition if they are used periodically. There is a 2-year Impex warranty that covers any issues that may arise with the machine. The rack has an adjustable weight bench for upper body compound movements, such as bench press, that can be adjusted to do incline and decline movements. Moreover, there is a dual-action foam leg developer that can be attached to the bench, allowing for lower body accessory work. On top of that, the machine has butterfly chest arms on the interior of the machine, as well as a variety of cables for chest flyes and shoulder work. There is also a dual-action foam leg developer that can be attached to the bench, allowing for lower body accessory work. By far the most important feature is the smith machine barbell. This can be used for squat and other compound movements. Finally, this machine also comes with several implements to be attached to the cables to hit specific body parts. Here is a short list of some important positive and negative aspects of the Marcy Diamond Elite Smith Machine. High Quality. The frame and all pieces of this smith machine are crafted with heavy duty steel and chrome implements, meaning it is going to last. Various Pieces. 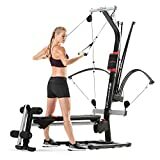 As listed above, the machine comes with quite a few attachments and accessories that will allow you to fine tune your workout and hit every muscle group. Easy Upkeep. This machine will last a long time with very little maintenance, aside from the occasional wipe down. Convenient. 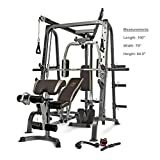 Although it may seem bulkier than just buying a set of dumbbells, the Marcy Diamond Smith Machine is quite space efficient considering all the features you are getting for one home gym. Safety Features. This machine has catch bars and safety stoppers to ensure that you are safe to use it even when you are alone at home. Assembly. This machine does not come assembled, so you will have to set aside a day to assemble it on your own or have someone do it for you. This will take several hours, but once you finish doing that, you will not have to deal with it again. Stationary. This machine is quite heavy and does not come with wheels. Therefore, once you assemble it, most likely it is not going to be moving anytime soon. This can be good because you know it is sturdy. On the other hand, just make sure you are putting it where you want it to stay right from the start! There Are No Free Weights. You will have to buy your own set of Olympic weight plates to use with this machine separately. However, that is usually the case with home gyms of this type. 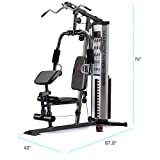 User reviews of the Marcy Diamond Elite Smith Machine have been complimentary, as people have been able to fulfill all of their exercise needs. 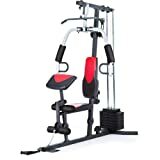 It has all the accessories you could need in a home gym, and it has some of the highest quality of equipment you will find in an all-in-one home gym. A couple people took issue with the fact that they spent a lot of time with the assembly. On top of that, they also brought up the fact that they had to acquire the weights separately. 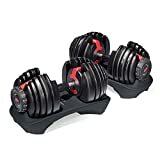 On the other hand, once you have built the cage and bought the necessary free weights to accompany the equipment, it is one of the nicer home gym setups that are out there. Overall, buyers seem to be very pleased with the machine. 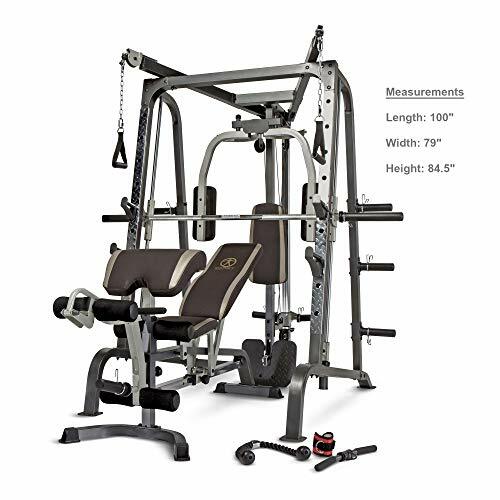 If you are looking for a good home gym equipment, Marcy Diamond Elite Smith Machine appears to be one of the nicer options. At first, you will have to spend a brief period of time putting it together. However, you should consider the fact that will last you a long time. Along this period, you’ll be able to enjoy many efficient workouts. No matter what your fitness regimen may entail, this smith machine has all the tools to get you on the right track. We recommend this cage to anyone looking for a new home gym.